Dr. Khatri has immense experience as an Oncologist in treating all types of Cancer patients in leading centers in New Delhi. 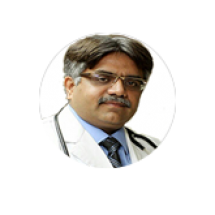 As a Professor of Medical Oncology, he has an MD degree in General Medicine.While pursuing his professional qualifications, Dr. Khatri served as Senior Resident in the Department of Medicine at the Lok Nayak Hospital and Guru Teg Bahadur Hospital in New Delhi. In addition, Dr. Khatri has also obtained a Diplomate of the National Board (DNB) title in Medical Oncology through the Rajiv Gandhi Cancer Institute in Delhi. He has over 15 years of experience of satisfied patients in his field. Sameer Khatri has participated in several research studies and clinical trials as Principal Investigator. His articles and papers have been published in various medical journals of repute, and quite a few of his contributions have been presented at medical conferences connected to his field. He also had one of his papers selected for presentation at the IMSACON Conference in Cambridge, United Kingdom, in 2002. He has also been the recipient of awards at conferences for his poster and paper presentations over the years.